Bayern Munich remain second in the Bundesliga after beating Stuttgart. James Rodríguez played 15 minutes in a game. James Rodríguez played 15 minutes in the Bayern Munich victory over Stuttgart for the Bundesliga. The Bavarians achieved an important victory and remain second in the standings to six points behind Borussia Dortmund. Neuer, Süle, Hummels, Thiago, Martinez, Lewandowski, Goretzka, Müller, Alaba, Coman and Kimmich. Zieler, Emiliano Insua, Kempf, Kabak, Beck, Santiago Ascacibar, Zuber, Esswein, Gentner, Donis and Nicolás González. 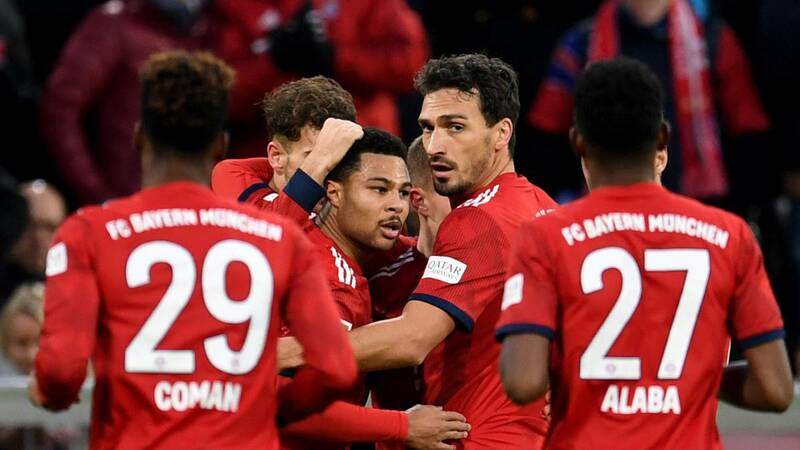 The 19th day of the Bundesliga continues this Sunday at the Allianz Arena in Munich, where Bayern will receive the visit of Stuttgart in a key match for the realities that live both teams in the high and low part of the classification. The home team must win to cut the difference with respect to the leader Dortmund, while visitors need to add to leave the promotion area. Following the end of the year recess and playing last weekend in Sinsheim, Bayern Munich returns to his stadium to play his first official match of 2019 at home. Niko Kovac's team will face the Stuttgart, a rival who must overcome taking into account the difference of campaigns that both teams make this season. In addition, the current champion of Germany started with right foot the year to win 1-3 on Friday January 18 at Hoffenheim. "We want to win the game and stay there in the fight for the lead. we must underestimate anyone If we entered the game as we did in the first half against Hoffenheim, I am sure that we won the match, "said Kovac at the press conference prior to the engagement that will begin this Sunday at 9:30 a.m. the morning at the Allianz Arena, where Bayern has four wins, three draws and one defeat this season. The Bavarians are second in the Bundesliga with 39 points. For this match, Kovac will not be able to count on two of his referents, the experienced fliers Frank Ribery and Arjen Robben, who remain in the medical department (the Frenchman recovers from a muscle break, while the Dutchman works to overcome a physical problem in a thigh). However, the Croatian coach will be able to count on Serge Gnabry, who was in doubt at mid-week for neuromuscular problems but is able to play. While Bayern is betting on a new title of the Bundesliga, Stuttgart live a different present in the lower part of the table. The team led by the German Markus Weinzierl is second-to-last with 14 units and is currently under promotion, although Hannover and Nürnberg are a short distance behind in the area of the Descent, which has been a headache for the last few seasons for one of the historic clubs in Germany. "Bayern is the clear favorite, has good players and is in great form, regardless of the final result, our performance will give us a boost for the following games, I can say that the team worked well in the preparation and showed a very positive atmosphere in the camp. We have been training intensively to add ", commented coach Weinzierl, who has his unstable post after getting just one victory in the last five days. Stuttgart started 2019 with a defeat by 2-3 against Mainz, on Saturday January 19 in The Mercedes Benz Arena before his team The last time he scored three points was on December 15 when he beat the Hertha in Berlin 2-1, but in his recent visit to the Allianz Arena in Munich he surprised Bayern and scored 1-4, on May 12 last year although at that time (the last date of the season 2017-18) the place was already a champion.